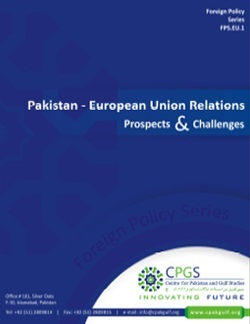 Pakistan and the European Union’s relations established in 1962 are 52 years old. The first cooperation which was initiated between the EU and Pakistan was in 1976. It was followed by a formal Commercial Cooperation Agreement in 1986. However, the 2004 Cooperation Agreement paved the way for closer relations. Since the start of this cooperation, the Commission has committed more than €500 million to various projects and programmes in Pakistan. Currently, there are 48 bilateral and multilateral treaties between the EU and Pakistan, of which 47 have entered into force. There are also over 86 projects currently in progress, covering a wide range of sectors. The relationship is moving from what has traditionally been a more tradeoriented relationship to a political and strategic one. Recent granting of the GSP status, and the visit of a four-member European Organization for Nuclear Research (CERN) team to discuss Pakistan’s associate membership application and plans with the Higher Education Commission (HEC) to develop Pakistan’s research potential are positive steps in furthering cooperation. Total assistance for Pakistan by the EU and its Member States for the time 2009- 2013 amounts to €2,458 billion, which represents around 30 percent of the total annual development assistance to the country. The EU provided €398 million (2007-2013) though its budget to Pakistan (via the Development Cooperation Instrument (DCI). Activities under this Instrument focus on rural development/natural resource management and on education/human resources management. The EU has also worked extensively to provide emergency aid and relief to victims of natural disasters in Pakistan via ECHO – European Community Humanitarian Office. The total amount of aid received from ECHO since 2009 has been €313million. The EU is Pakistan’s single largest trading partner, accounting for 22 per cent of Pakistan’s external trade. In 2012, Pakistan’s total trade with EU amounted to €8.2 billion. Pakistan’s imports from EU mainly consist of textiles, medical equipment and leather products; while EU’s exports to Pakistan consist of mechanical and electrical equipment, and chemical and pharmaceutical products. On December 12, 2013, the European Union (EU) further granted ‘Generalised System of Preferences (GSP) Plus’ status to Pakistan with an impressive count of 406 votes, granting Pakistani products duty-free access to the European market. The GSP Plus status will allow almost 20 per cent of Pakistani exports to enter the EU market at zero tariff and 70 per cent at preferential rates.